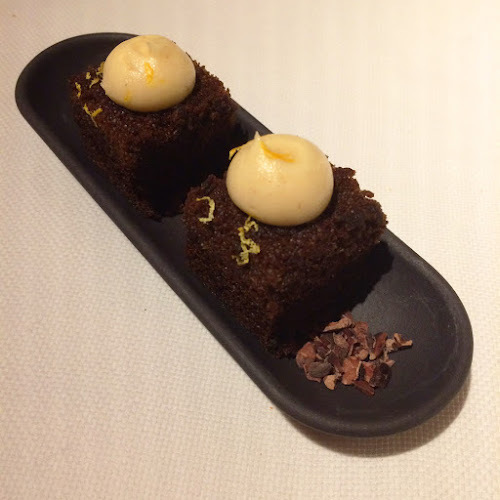 When Magdalena opened in the Ivy Hotel last year, I took one look at the menu and the prices and determined that we'd probably never eat there. We just can't afford $38 entrees and $25 appetizers. But lucky for us, they participated in Baltimore Winter Restaurant week, so we were able to enjoy a fine 3-course meal at the reasonable price of $35 per person. The day before our scheduled dinner, I received an email from OpenTable saying that the restaurant had cancelled our reservation. A phone call to Magdalena confirmed that we were still on the books, and I didn't have to pull out the, "don't you know who I am?" card. (No, I haven't ever done that. Mostly because it would be greeted with a shrug and a blank stare.) Probably an OpenTable glitch. But as we left our car with the valet (which is complimentary) and followed the two employees who each opened one of the two doors into the restaurant for us, I still had some feelings of trepidation. Hearing "your table is ready," was music to my ears, as was the jazzy music--including my favorite Ella Fitzgerald--coming over the sound system. 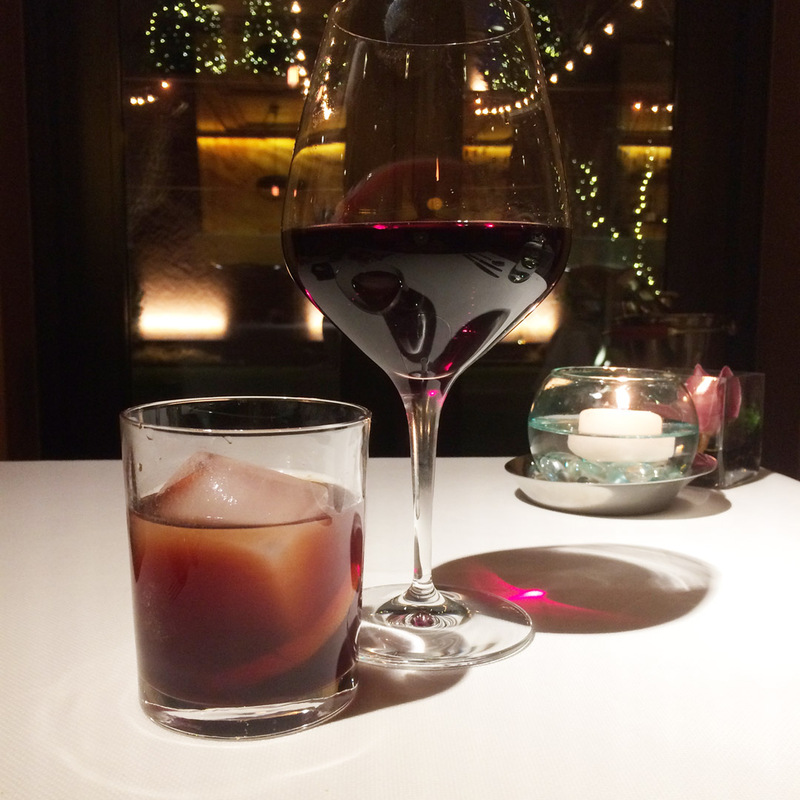 We were led to a corner table at the banquette facing the courtyard in the dining area nearest the bar. We like to eat early, for many reasons, and have found that doesn't always get us a good table. In fact, it usually scores us a pretty crappy one, like near the POS station or bathroom. So getting what seemed to us to be a very nice table with a view was a good way to start our meal. We ordered drinks. I had a glass of Pinot noir, and Mr Minx ordered the Bookie. A riff on a Manhattan, it involved Maker's Mark bourbon and Averna Amaro, garnished with a strip of lemon peel and a Luxardo Maraschino cherry. The drink cost $18, which is just $7 shy of the price of an entire bottle of Maker's Mark at our favorite liquor store. It was tasty, sure, but the price was excessive for such a simple concoction. Sure the booze was pricey, but we were getting a bargain as far as the food was concerned. Mr Minx started his meal with the potato and watercress soup with Benton's bacon dumplings and tarragon. 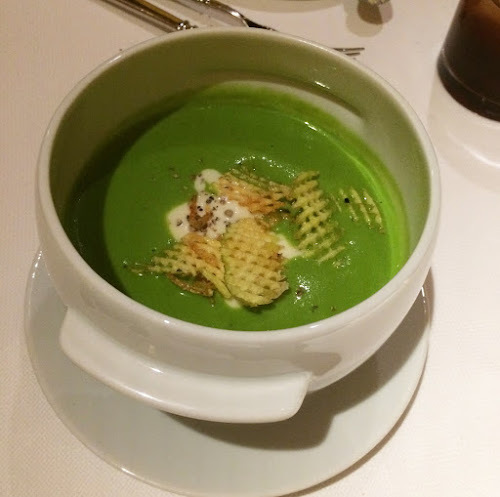 The generously portioned green concoction was smooth and surprisingly light; the bitter flavor of the watercress was balanced nicely by the blandness of the potato and especially the strong smokiness of the bacon. 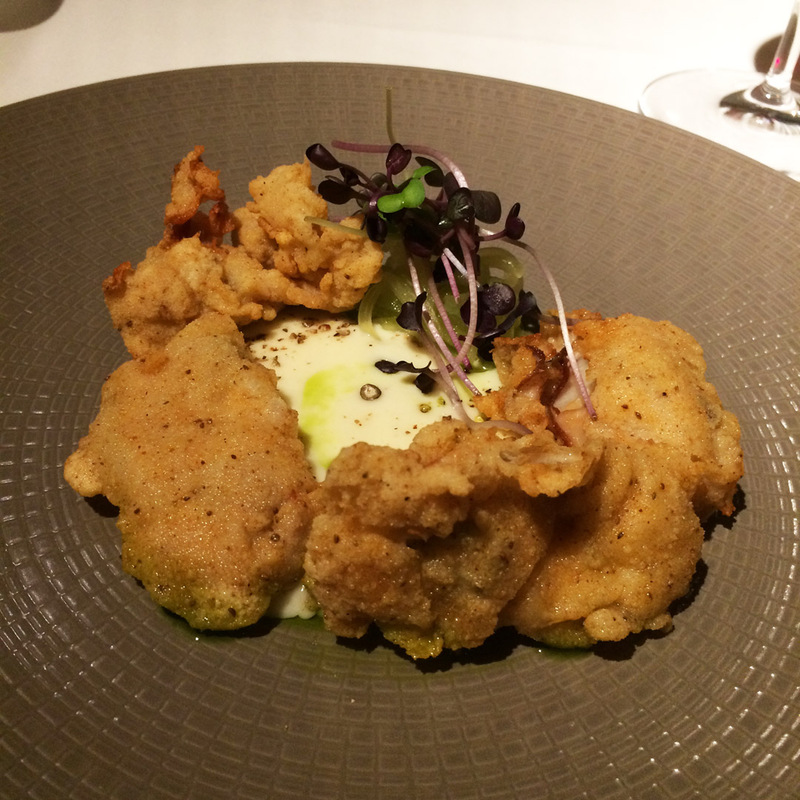 My fried Maryland oysters were specifically Holy Grails, from Hooper's Island Oyster Aquaculture Company. The pleasantly salty bivalves were plump and perfectly cooked and served with a creamy horseradish-flavored sauce and a little pile of lightly pickled shaved cucumber reminiscent of the cucumber salads familiar to all Marylanders. There were three entree options, one of which had a $30 upcharge ($50 on the Restaurant Week web site) which meant for us there were only two. 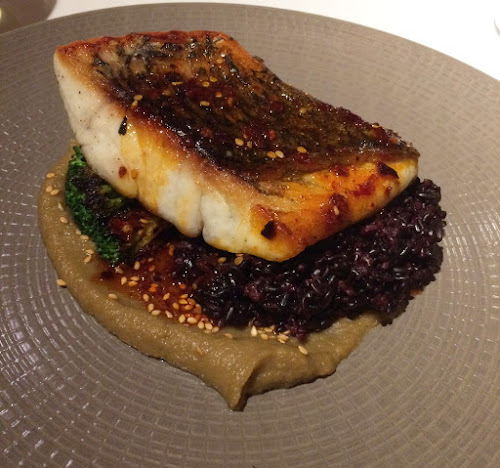 I was intrigued by the idea of candied eggplant, so opted for the filet of sea bass, which also came with forbidden rice, broccoli, and chili oil. I was somewhat disappointed that the eggplant was a puree. It was lightly sweet, but not what I'd consider "candied." However, it was a nice foil for the rice, which was doused in an acidic and quite hot chili oil. The fish was tender and perfectly cooked, with a nice crisp skin, but my favorite part was the broccoli. It had been roasted to a lovely crisp-tender texture, well-seasoned and buttered, with a pleasant roast-y flavor. 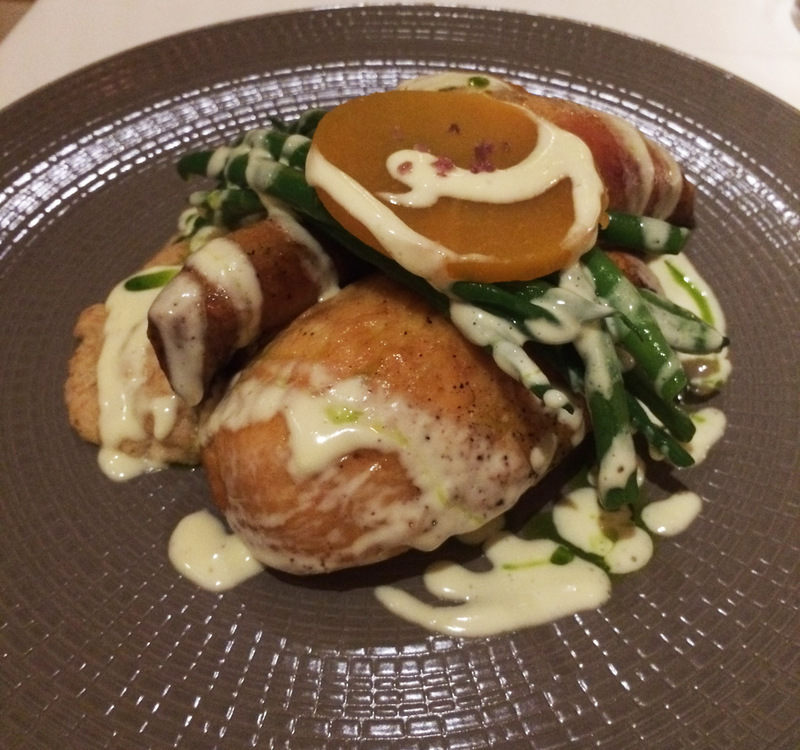 The other attractive entree option was roast chicken with bread sauce. What Mr Minx received was half a baby chicken that was clearly of very high quality. It was that rare chicken that had real flavor, juicy with the smack of chicken fat and simple seasoning. The sauce, a classic accompaniment to simple roast fowl and a nod to Chef Mark Levy's British heritage, was creamy without being overly rich, thanks to its thickening agent of bread. French beans and tender slices of rutabaga--a homely root vegetable rarely seen in restaurants--made the dish homey and comforting. All three dessert options sounded wonderful, but we could only eat two. 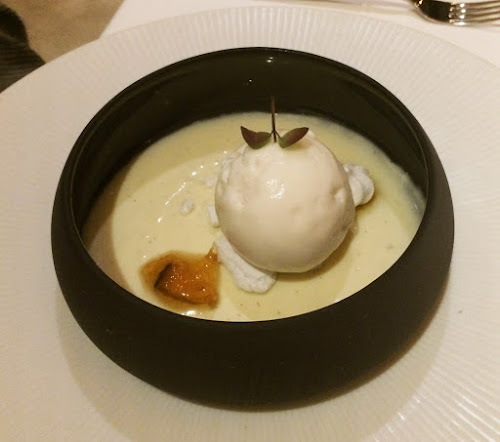 The Meyer lemon posset was something else not usually seen in restaurants (or really anywhere in this country). An olde worlde kind of dessert, a posset is a very simple pudding of cream and sugar and some sort of citrus flavoring which curdles the pudding and helps it set. It was quite tart, though the coconut sorbet added a little sweet relief. 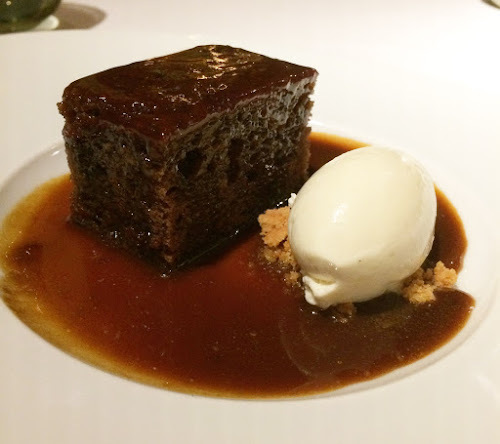 My sticky toffee pudding was just sweet, in a soothing old-fashioned molasses-y kind of way. The pudding is actually a dense cake made with dates and drenched with a caramel sauce. The flavor is reminiscent of gingerbread, but without the spices. A perfect little quenelle of whipped cream flavored with a touch of Earl Grey tea added a bit of light and creamy contrast. Speaking of gingerbread, we received a tasty mignardise of mildly spiced gingerbread topped with lemon buttercream along with our check. A nice touch in an evening full of them, starting with the crusty bread rolls accompanied by whipped butter flavored with sweet soy and yuzu brought to us at the beginning of or meal. The server urged us to tuck into them right away while they were still hot from the oven. Magdalena is a small gem of a restaurant with delicious food and really terrific service. (It was impeccable, not quite formal, accommodating but not intrusive, very polite and friendly. Kinda perfect, actually.) But the only way most of us will ever get to enjoy the place is during Restaurant Week. I urge readers to be on the alert for the summer version of this biannual event and if Magdalena participates again, run, don't walk, to your phone or OpenTable and make a reservation. Otherwise, start saving up to enjoy a meal there at any other time of the year.